Today, I'm happy to welcome a very interesting guest blogger, John J. Le Beau. Dr. John J. 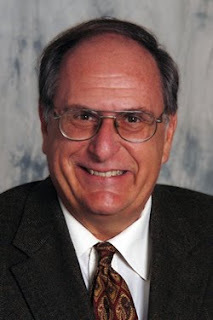 Le Beau is Professor of Strategy and Security in the College for International and Security Studies at the George C. Marshall European Center for Security Studies in Garmisch, Germany, and a permanent faculty member of the Marshall Center’s Program on Terrorism and Security Studies. Dr. Le Beau is also Chairman of the Partnership for Peace Consortium’s Combating Terrorism Working Group (CTWG), which enjoys a broad international membership. The CTWG is currently addressing the issue of intelligence cooperation against the terrorist target. He's the author of the novel, Collision of Evil, summarized here. "As evening falls against the majestic backdrop of the Bavarian Alps, Charles Hirter, an American tourist, is savagely murdered. In the peace, quiet and pastoral splendor of this magnificent setting, Charles Hirter draws his last breath. Was Charles simply in the wrong place at the wrong time? "Kommissar Franz Waldbaer, the German detective in charge of the case, faces an investigation that yields neither clues nor suspects nor motives. A gruff, go-it alone detective, Waldbaer is dismayed by the arrival of Robert Hirter, the victim's brother, who insists on joining the investigation. But there is more to Robert than meets the eye. "As Robert and the Kommissar uncover a nefarious nexus of evil past and evil present, they find themselves probing dark, long-forgotten episodes from the Third Reich in order to identify the present threat. "Thrust into a violent world of fanatic passions, malevolent intentions and excruciating urgency, Robert Hirter and Kommissar Waldbaer must race against the clock to stop a sophisticated, covert, and deadly plot." In Dr. Le Beau's guest blog, he discusses his characters. Thank you, Dr. Le Beau. One of the elements that runs through ‘Collision of Evil’ is the evolving relationship between the American character Robert Hirter and the German Kommissar of police, Franz Waldbaer. In a sense, the two protagonists play off of one another throughout the novel. When I first began to gestate the concept of the story, Waldbaer was the first character that came to mind as essential to the plot. I had from the beginning envisioned the setting of the book as being in Bavaria, along with much of the action, and knew that a German – and more precisely a Bavarian – police detective would have to figure importantly in the writing. So, the Waldbaer character was the first one devised. As the first rough draft of the book’s initial chapters took shape, it became clear to me that an American protagonist, and not just an American murder victim, would add considerably to the story. Accordingly, Robert Hirter was born and came into play. This permitted some dramatic interplay between the two main characters to transpire. I tried to portray Waldbaer as embodying some ‘old world’ German traits, with Hirter a character with an American outlook and perspectives. Waldbaer is arguably a bit plodding, though organized in his own way, and quite thorough. These are sort of stereotypical German features, by my lights, based on having lived many years in Germany. Waldbaer likes beer, which speaks to his Bavarian identity, as beer is a real cultural feature of Bavarian life, often referred to by the natives as “liquid bread”. It might also be said that many Germans are rather more pessimistic than Americans on a broad scale, and I tried to capture this element too, with a rather introspective Waldbaer skeptical of making headway at times during the investigation, and in his worries about his own health. Robert Hirter, on the other hand, is portrayed in a way that I imagine many Americans to be: action-oriented and a bit impulsive and impatient; wanting to get things done right away. Hirter is more casual in dress, language and overall style while Waldbaer is more formal and conservative. As well, the two characters compliment each other in another sense. Waldbaer is a professional law enforcement officer. Hirter is a clandestine intelligence operative, something quite different in terms of training, mission and attitude. Law enforcement officials (such as policemen) are trained to enforce the law. Intelligence officers are trained and authorized to break the laws of other countries in the interests of getting things done. The two professions view the world rather differently and I wanted to include these two distinct perspectives in the novel, as this is something that occurs in real life. Despite differing backgrounds, training and mission, however, Waldbaer and Hirter are able to effectively work together – just as law enforcement and intelligence officials can and do cooperate in the real world, if not always perfectly or easily. A word about the Kommissar’s name might be in order. Franz is a typically Bavarian name, the German equivalent of Francis. It is not a name one would commonly associate with Northern Germany. The name ‘Waldbaer’, translated into English, means ‘forest bear’. I created the name because I thought it captured the physical way that I image the detective: a sort of heavy, large creature, generally a bit lumbering – but surprisingly capable of action when required. I also just liked the name! Both Waldbaer and Hirter feature again in a second thriller that I am currently writing. Their nemesis is new but the plot is another international thriller set in several locations, but with Bavaria figuring again importantly in the storyline. Thank you, John! It was a pleasure to have you as guest blogger today. 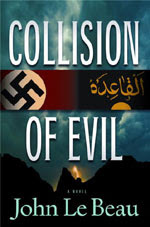 Collision of Evil by John J. Le Beau. Oceanview Publishing, ©2009. ISBN 9781933515540 (hardcover), 336p. What a fascinating story! And with John's background, he's the perfect match to write it. Thanks for introducing us to him. My pleasure, Elizabeth. It's always interesting to welcome a crime fiction writer I'm not familiar with. Another great post by the author. Enjoyed the previous post about the "place". Now we learn more about the "people". It was a good idea to "blend" in the two cultures. Looking forward to more. Ah, you're following John J. Le Beau's guest blogs, misterrereeder. Thank you for stopping by here! Thanks for stopping by, John. As a reader, one way I get to see the world is through books, so I appreciate authors who introduce me to interesting settings and characters. Thank you! If the book is half as interesting as the author - it's bound to go far! Thanks for sharing the post. Thank you for the comment, itsamystery. Hope you read, and enjoy, the book!